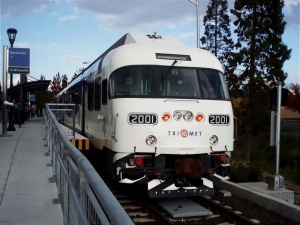 TriMet WES (Westside Express Service) is a commuter rail line (using diesel multiple units) between Beaverton and Wilsonville. Connection to MAX Light Rail is available at Beaverton Transit Center. WES operates on weekdays only every 30 minutes. This line uses Proof of payment fare system. Purchase ticket before boarding. The rail cars accommodate bicycles onboard and is accessible to disabled riders without staff assistance. This page was last edited on 15 January 2019, at 20:02.